Parrots—African greys, in particular—are quickly becoming one of the most popular pet species. African greys are by far one of the smartest animals on the planet, with an intelligence level equal to that of a 5-year-old human and an emotional capacity of a 2-year-old. Greys make wonderful pets, although figuring out the age of an older parrot can be a challenge due to a lack of visible indicators. Speak with the breeder of your parrot if at all possible. The majority of parrot breeders keep very close records of birds they have raised and should be able to provide you with a hatch date for your African grey. If the breeder does not have an exact date, he or she can at least give you an estimate of how old your bird is. 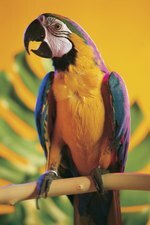 Have your parrot examined by a veterinarian specializing in birds. An avian vet will have the expertise to help you age your bird. The vet can also help show you the proper way to care for your bird and the signs to look for in guessing his age. Measure and weigh your bird. An average-sized African grey will measure between 12 and 14 inches beak to tail and weigh between 400 and 600 grams. A bird that is considerably smaller than that is most likely younger than 5 years old. Watch for signs of moulting. Moulting is the process by which birds shed their older juvenile feathers and grow in their adult plumage. Your parrot will moult between the ages of 18 and 24 months, helping you to guess at its age. Look closely at your parrot's eyes. Greys under 6 months of age will have very dark gray or black eyes. At a year of age, the eyes will turn a lighter gray. As your bird reaches approximately 2 years old, its eyes will turn a darker straw color. The iris will turn a light yellow between ages 3 and 5 as your bird reaches maturity. Ask your vet to draw blood and check the hormone levels of your parrot. Once your bird reaches maturity, it is very difficult to guess at its age. A blood test can check a female's hormone levels and help you determine if she has hit her fertile period at approximately 7 years of age, or if she is beyond fertile at around age 40.